Brightly illuminating the ‘sölvesborg bridge’, swedish design firm ljusarkitektur has developed a unique lighting scheme to enhance its landmark status. 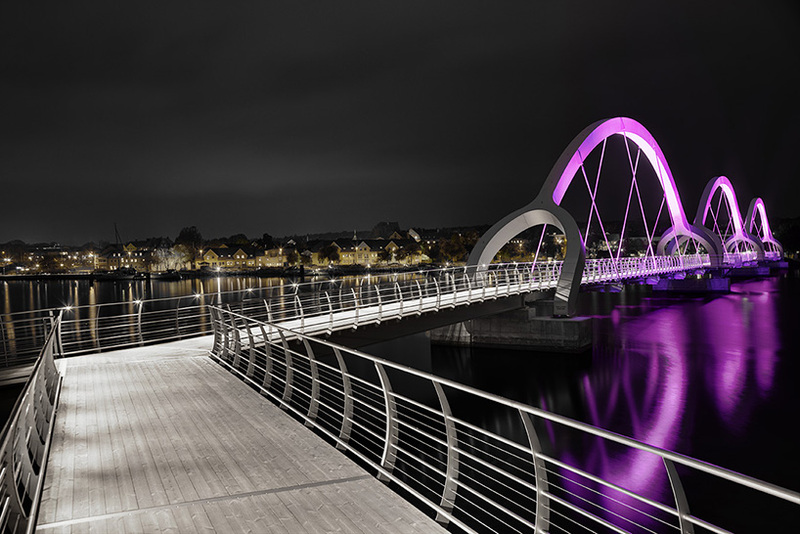 the use of color changing LED fixtures from lumenpulse graze the suspension cables of what is considered europe’s longest bicycle and pedestrian viaduct. highlighting the distinctive arches, the pieces were mounted on the outside of the 756 meter long structure. the overall design was achieved without impacting on the local wildlife – to limit glare, the firm integrated deep, custom glare shields, which also hide the light sources. influenced by the surrounding fauna and flora, ljusarkitektur pushed the fixtures’ flexibility and controllability to program different color sequences throughout the year. managing to be both dynamic and understated, the glowing, reflective installation has turned the bridge into an attraction in its own right. designers ljusarkitektur used durable, programmable LED fixtures to enhance the bridge’s landmark status,the firm used color changing lights from lumenpulse to illuminate the suspension cables and light the distinctive arches,the fixtures were mounted on the outside of the bridge, to the bottom of the cables,ljusarkitektur used deep, custom glare shields to hide the light sources and limit any potential glare. Zhongshan Xingmu Lighting Technology Coj.,Ltd. Zhongshan Zaoyang Optoelectronics Technology Co., Ltd.
Shanghai UBM Sinoexpo International Exhibition Co.,Ltd. (All Rights Reserved).